He is a consultant on the design of consumer products to OSIM International in Singapore, a consultant on gear systems dynamics to Pratt & Whitney and a consultant on ultra-precision, high-speed automation systems to the Singapore Productivity and Standards Board. 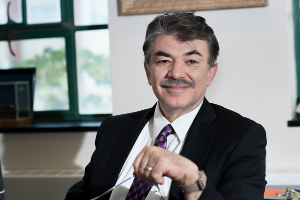 Professor Kazerounian has served on the editorial board of ASME Applied Mechanics Review and ASME Journal of Medical Devices and has been Associate Editor of both the ASME Journal of Mechanical Design and the Journal of Mechanisms and Machine Theory. He is a Fellow of ASME and is the recipient of the ASME Design Division Mechanisms and Robotics award (a life time achievement award) in recognition of Cumulative Contributions to the Field of Mechanisms Design and Theory in 2006, the George Wood award in recognition of Significant Contributions to the Field of Mechanisms and Robotics in 1997, and the ABB Outstanding Faculty Award in 1997.